Our fews days at De Boca en Boca were fantastic. It's in a great base to get around town and there are great, affordable options for activities outside of the town as well. We felt completely safe and would definitely recommend staying here. Two added bonuses too - they offer free guest passes to a local gym as well as a local pool! Really nice hostel with helpful and friendly staff. Good atmosphere in the evenings with activities on every night. Loads of areas to hang out in the common area. Excellent location close to everything in the middle of the city. This was a great place to stay, very clean, staff is helpful and friendly. We met a lot of travelers from all over the world who were all friendly and great to talk to. 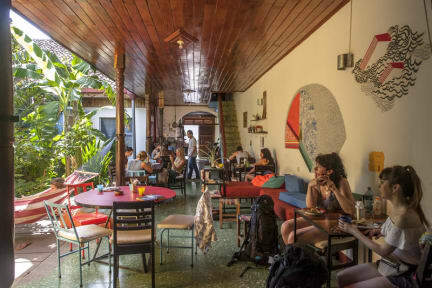 This is a wonderful hostel, I stayed there twice during my time in Nicaragua. The staff and volunteers are very welcoming and friendly and very helpful. The kitchen and common areas are large enough that it never felt crowded but there were always people around. There’s a bar in the hostel which adds to the atmosphere but it quiets down so you can sleep easily. Overall a great place that I definitely recommend when you’re in Granada! This was a nice hostel. It was very calm/chill. Not a huge party scene in Granada during Semana Santa. The room was great. Lots of space and real beds (no bunk beds) in our 4 person dorm. It was just VERY hot. However, fans were provided for each bed so it was tolerable. I really enjoyed the hostel! Great staff ! Warm atmosphere! 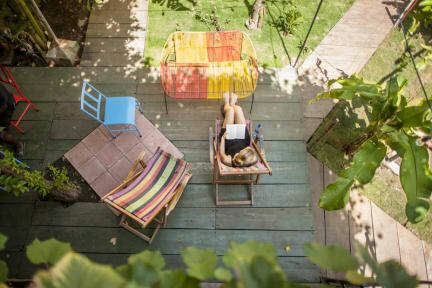 Highly recommend it if you’re staying in Granada. Atmosphere is really chill and there’s lots of places to lay around. There’s a bar and pool table. WiFi is pretty good. Bunks are ok, with big lockers. Maybe one outlet per bed. Bathrooms are clean. Security was good and staff was helpful. Couple blocks from everything.